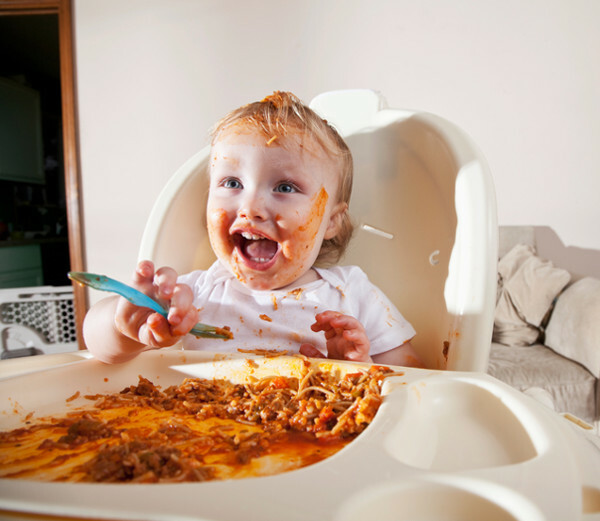 You gotta love babies – so much mess for such little people. Whether you have a newborn, or your little is one bum-shuffling, army crawling, up on all fours or toddling around the home and beyond, there is bound to be a stain solution here that will save your bacon (and your baby’s clothes!). Yep, we’re going there. This will most likely be the first stain you’ll be faced with as a new parent – consider it a baptism of fire. Immediately rinse the stained item in cold water. If the stain is allowed to dry, it will be more difficult to remove. Soak for one hour or overnight in an enzyme pre-treater, such as one lid of Sard Wonder Soaker in seven litres of warm water. Wash using Cold Power Sensitive liquid or powder and wash as the care label recommends. 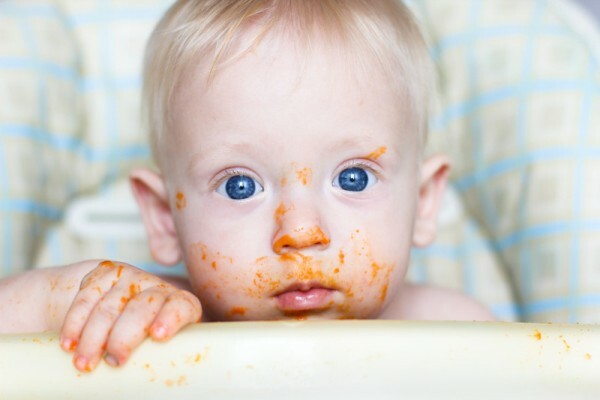 That tell-tale bright orange glow on a happily, spaghetti-filled face is often matched by equally bright clothing and bib stains. Immediately scrape or blot surface. Pretreat by soaking for one hour in an enzyme pre-treater, like one lid of Sard Wonder Soaker in seven litres of warm water. Remember when Violet Beauregarde from Charlie and the Chocolate Factory turns into a giant blueberry? It’s a scene repeated in houses across Australia every day, after little ones have munched through their fill of those delicious, yet wickedly-coloured berries. Here’s how to sort the associated stains. Immediately blot with absorbent paper or dry towel. Pretreat by covering the stain with a stain pre-treater such as Sard Wonder Stick, Soap or Spray, following pack instructions. Speaking of almost luminescent stains, how about carrot? Now there’s a tough one to remove! This treatment will also work for baby formula stains (otherwise known as baby spew). Immediately rinse by holding stained area under cool running water. Pretreat by soaking for one hour or overnight for heavy stains in an enzyme pre-treater such as one lid of Sard Wonder Soaker in seven litres of warm water. This is the stain that just keeps giving all throughout childhood. Particularly when they’re first starting to walk and run, and throughout the school years. Best get this little routine down pat! Pretreat by soaking for one hour (or overnight for heavy stains) in an enzyme pre-treater, such as one lid of Sard Wonder Soaker in seven litres of warm water. Or, rub with Sard Wonder Stick, Soap, or Spray, following pack instructions. Remember to follow the back of pack instructions for correct dosage and procedures to obtain the best stain removal and washing results for any Cold Power or Sard Wonder products. 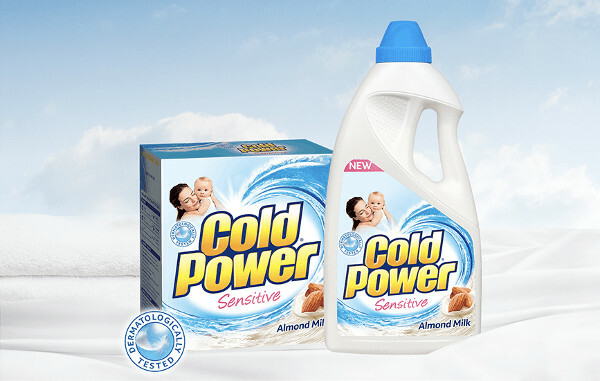 Just because Cold Power Sensitive is gentle on skin, it doesn’t mean it isn’t tough on stains. It has been specially developed to provide the same performance as the rest of the Cold Power range as baby and kids’ stains can be very hard to remove. If using a pre-treater, always test for colour fastness before application. Cold Powder liquids and powders have been specially developed for cold water wash, as nearly two thirds of washes in Australia are done in cold water. However it is even more effective in warm or hot water wash, especially on greasy stains. There are a couple of common denominators at play here, and they are worth remembering – kids are messy, and Cold Power Sensitive is your ally when it comes to baby stains.